I’ve run this interview before, but William Holloway is a name you need to know. So I am running it again. William Holloway is the best new horror writer publishing today, and recently he released the first novel in his six-part Lovecraftian epic: The Immortal Body. William was kind enough to spend a few minutes answering my questions. Pay attention folks, because soon you’ll only find him in the pages of high brow literary publications that charge an access fee. He’s that good. Let’s start with the most important thing—tell us a little bit about your most recent book. 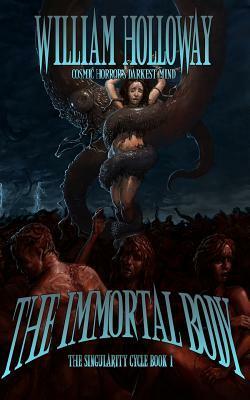 The Immortal Body is the first novel of the Singularity Cycle, which is a six part Lovecraftian novel series. The first two novels; The Immortal Body and Song of the Death God have been completed for a while and I’ll be done with the third one in the next few days, then it’s on to the forth. I don’t want to spoil the surprise too much, but suffice it to say that each novel, though part of the same overarching story, are very different creatures. The Immortal Body is largely told via the POV of the police investigating a series of nightmarish murders. Their real challenge is for them to see the thing that is happening in front of them, to see the impossibility of it and once they have crossed that threshold, to not go mad. There’s a lot happening in this book, and granted, it’s not for everyone. It’s a dark novel, I think as dark as one can be without wallowing in nihilism. It’s bloodier than most of what we see these days from Lovecraftian horror novels, and goes places that most horror will not go. That said, there’s an animation of the gritty and the grimy and the banality of everyday human evil and suffering that contextualizes it into the cosmic. The word Lovecraftian gets thrown around a lot. But while The Immortal Body has Lovecraftian elements, it is also a mythos unto itself. Do you consider yourself Lovecraftian, and has Lovecraft influenced your writing? Lovecraft has influenced my writing more than any other writer, and yes, I definitely consider myself a Lovecraftian though I don’t know that I’ll ever do formal Lovecraftian Mythos writing. The Wendigo made an appearance in Lucky’s Girl, but I can’t see myself writing a novel specifically using Lovecraftian Mythos deities. But, who knows? Maybe one day. Clive Barker and Brett Easton Ellis deserve honorary mentions as well. Both of them taught me that there really are no limits. “Weird Fiction” has always been a genre dominated by the short story. Lovecraft, Blackwood, Laird Barron are masters of that form. But you seem to prefer the novel. Any reason? I’ve tried, don’t get me wrong, but I can’t seem to write a short story. In fact I seem to be constitutionally incapable of doing so. My stories just aren’t short. It’s a talent I envy. I know The Immortal Body is part of a series. Do you know how many books are going to comprise that series? Do you have the whole story worked out in your head, or does it come to you as you write? It’s going to be a six part series. I have the general idea worked out of what will happen in those stories and how the stories link together, but as you know, things come to you while you’re writing. I’ve tried using really structured plans for writing a novel but when the words start to flow, that plan disintegrates. Ultimately I end up with what I want, but the means to get there changes along the way. Do you have a George R.R. Martin plan? In other words, what happens if you die before you finish it? Well, without giving a way too much, that particular problem is solved by the very structure of what I’m writing. But, if that day ever comes, I hereby pass the torch to Brett J Talley to complete my work. You’ve seen the good—and bad—side of publishing. Tell us a little bit about how you got to where you are. One of the worst spots that you can find yourself in is to have written a book that you know has merit, and then to confront the fact of publishing without a roadmap. That’s exactly where I was with The Immortal Body a few years back. There’s a bit of backstory to this and most of it has to do with naiveté. I wrote The Immortal Body (and about half of Song of the Death God) in in a short frantic blast. I never even thought about publishing it. Eventually I ended up on a friend’s self publishing vanity label. And then, nothing. I realized at that point that no one was buying it because no one knew it was there, so I started mailing out copies to people whose names I found on the Lovecraft eZine. You were one of them. Most of them never responded, but a few did, yourself included. Through you I found out about this guy in England named Graeme Reynolds who wrote a werewolf novel called High Moor. I read it and I loved it. I friended him on FaceBook and he read The Immortal Body and he liked it a lot. Shortly after that I wrote Lucky’s Girl, and sent it to Graeme because Lucky’s Girl had werewolves in it, and Graeme is the King of the Werewolves. I was looking for pointers on what to do with it, not to actually submit it. It hadn’t occurred to me that he’d want to publish it, but he did, and of that I count myself very fortunate. Do you have any advice for new writers just starting out? You have to find your people! Where does your audience hang out? Is there a website they frequent? A dark alley somewhere? I made zero progress until I found The Lovecraft eZine. And, you also have to remember an important rule; as much as it’s nice to be read by other authors, to be considered that guy that other authors think is super duper, you’ve got to focus on finding and keeping your audience. Other authors are not your audience. What other authors can do is give their seal of approval to your work, but ultimately you’ve got to move past them and carve out a niche amongst paying readers. Who are your favorite authors working today? Adam Nevill is the best writer in horror today. That’s a well known fact in the UK, but the US hasn’t caught on to that yet. Then there’s these Lovecraftian guys; Brett Talley, Rich Hawkins, Scott Thomas. Halloween is coming up. Any traditions? The Immortal Body just dropped, but what should we look forward to next from you? Six months from now Song of the Death God will be released. This is the Second novel of the Singularity Cycle which will ultimately be a six novel Lovecraftian epic. Again, without give away too much, each novel is very, very different, but they are all part of the same continuum. And where can folks find you on the net? Facebook. I don’t have an author page but I’ve been told I should get one.